BML Group Ltd. have operated Casino Euro online casino since 2002 and they are licensed by The Lotteries and Gaming Commission of Malta. 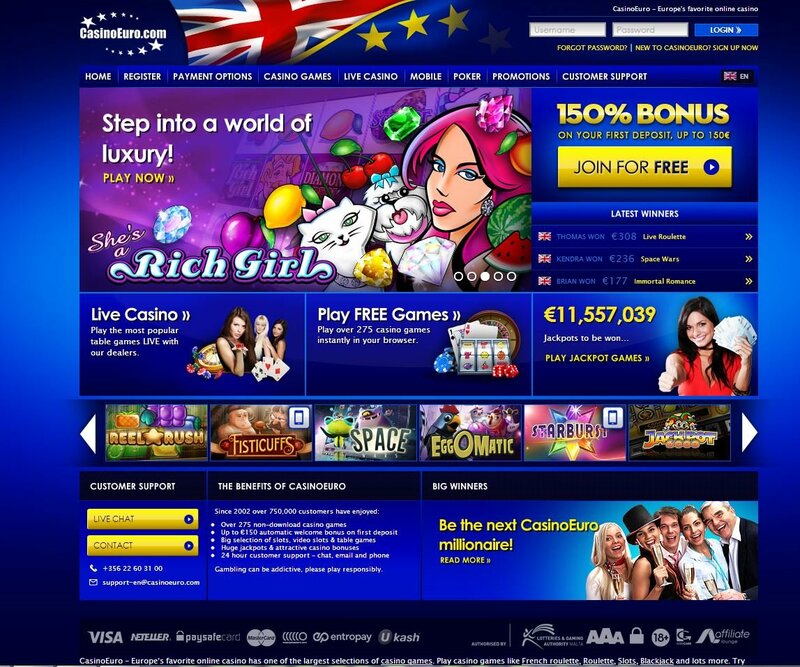 EuroCasino brings a bit of European class to its 750,000 players to date. 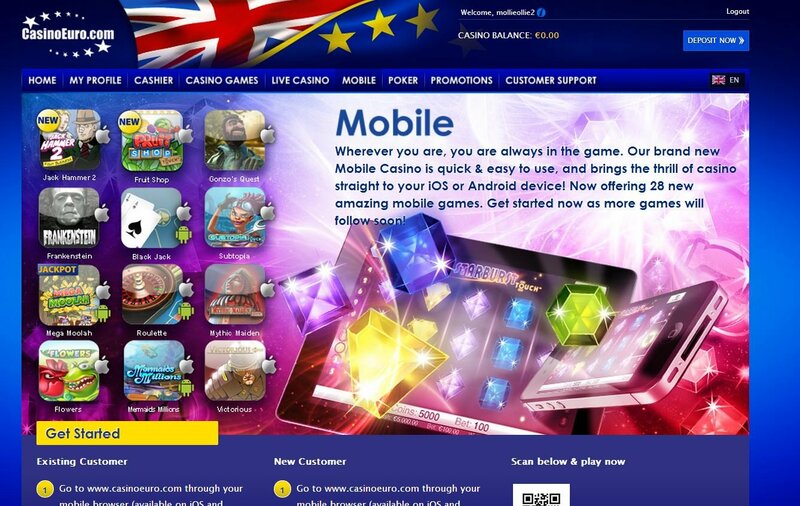 28 of their most popular games are available on their mobile casino for iOS and Android – mobile and tablet. Registration is as simple as can be and, there are no untidy, prolonged downloads in sight. 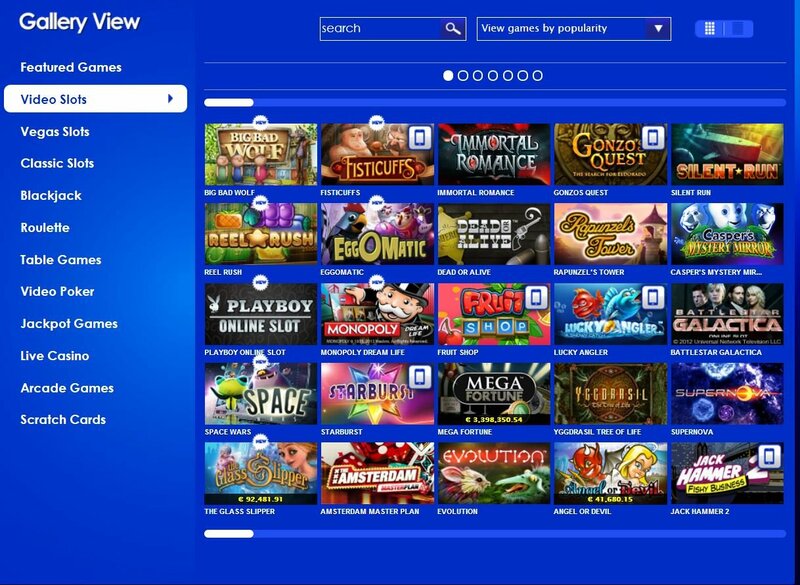 All games can be played from within your browser and, after a hard day of searching for online casino software on your computer or jamming up your phone memory with it, this is a huge relief. Graphics are sleek and the lobby is neatly arranged so you can quickly and easily find exactly what you are looking for, whether it be Video Slots, Vegas Slots or Classic Slots. CasinoEuro games run on several different softwares so there are a really diverse range and, as some of you may have gathered, my favourite table game is BlackJack when I am not enjoying a new online slot game and, the BlackJack tables at CasinoEuro are commendable in style, usability and enjoyment. There are over 275 games available and, no download needed for any of them. Celebrate the summer with these heart-warming welcome bonuses - get up to €150 on your first deposit with the 150% welcome bonus bonanza! You can enjoy a standard monthly bonus on a deposit match bonus of 30% up to €30 every month or, if you meet the criteria, enjoy an elite monthly bonus! Certain games also have special CasinoEuro bonus offers and surprise cash drops too! With these cash infusions, if the house has turned you inside out that day, you could still be quids in at the end of the day. The CasinoEuro Jackpots are not joking matter either, there some of the highest jackpots around - exceeding a million Euro! There's also a Fisticuffs Tournament every Wednesday where you could get €1,000 to help give you a little extra playing stamina. CasinoEuro payment methods aren’t the largest selection available in an online casino but, they cover most popular options and European country specific popular deposit options. Their easy-to-use and multi-platformed software options more than make up for any elusive payment methods for depositing. Withdrawal is limited to Instant Bank Transfer, unless you are withdrawing to a different method that you successfully deposited with previously. There are over 275 games available and, no download needed for any of them. Twelve different languages, spread out across Europe will ensure you are supported whatever your question, whether you want to live chat, speak on the phone or prefer to email. Anytime, night or day, CasinoEuro knows that without their players, they would not have anything and, they ensure their staff are highly professional and helpful. I felt very supported indeed and, they are always open, anytime I need something, which comforts me. CasinoEuro has some of the best and newest slots available. Between Cosmic Fortune, Game of Thrones, Invisible Man, Ive been pretty busy. It is great that they are up to date with new and exciting games all the time.